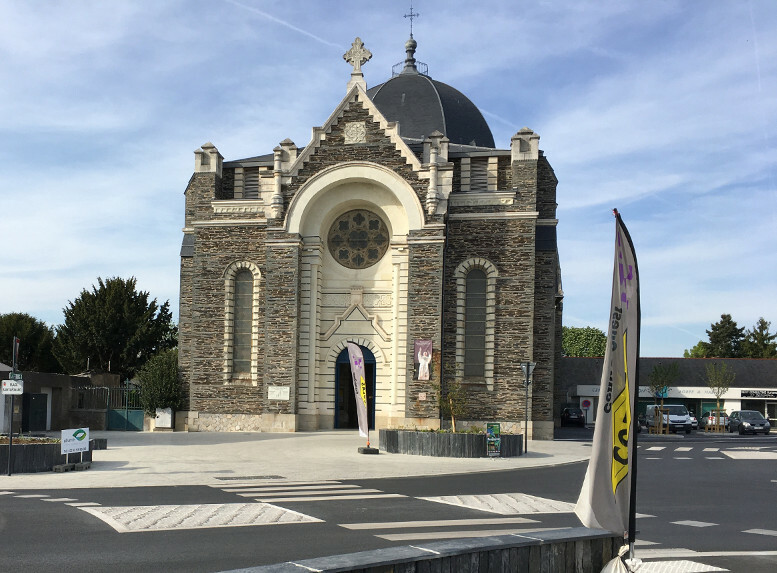 The Church of Saint Leonard at Angers – Maine et Loire – France - Site de federationstleonard ! 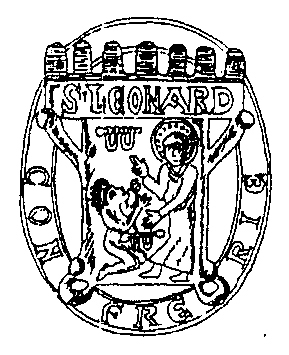 Since the 12th century there was mention in the archives of the “Vinee de Sancto Leonardo” and a little later, in 1265, a mention of the “Ecclesia Sancti Leornardi”. 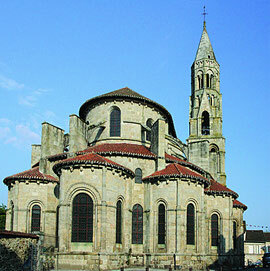 The monks of the Abbey of Saint Aubin of Angers, which owned a number of vineyards, constructed an oratory which became a chapel and finally a parish church in 1424. The parish of “Saint-Léonard-les-Angers” became a commune in 1784, was called ‘Sweet Fruits’ during the Revolution and had two mayors. It was attached to the city of Angers in 1794 and the parish of Saint Leonard became a district of the town. 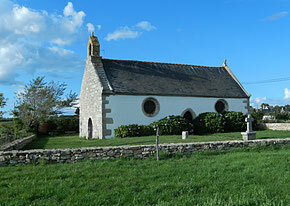 It is situated three kilometres to the east of the town centre, between Trélazé, Saint-Barthélemy and Les Ponts de Cé. 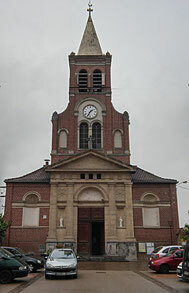 The district of Saint Leonard remained for a long time as a village, even after the construction of a new church whose centenary was celebrated in 1998. 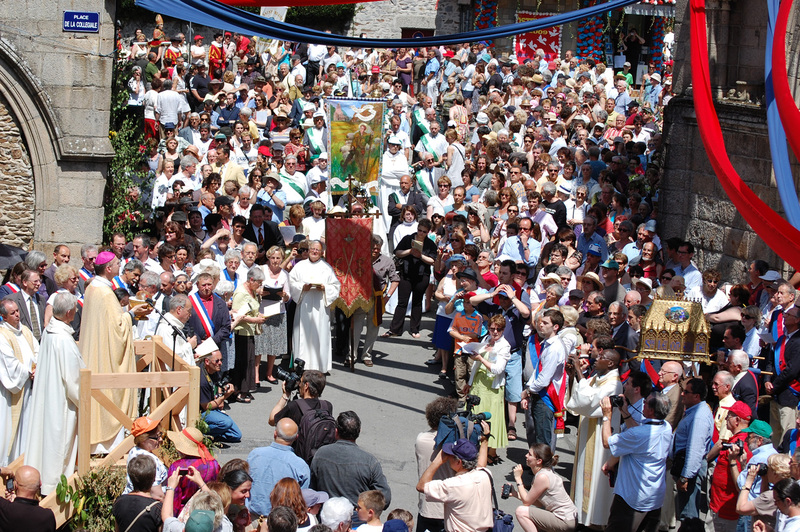 Up until the middle of the 20th century the Monday after Pentecost was marked by a grand pilgrimage to the parish church. In fact we have kept a relic, a finger bone which is attributed to Saint Leonard and which was found in the Church of Saint-Julien of Angers in 1670. 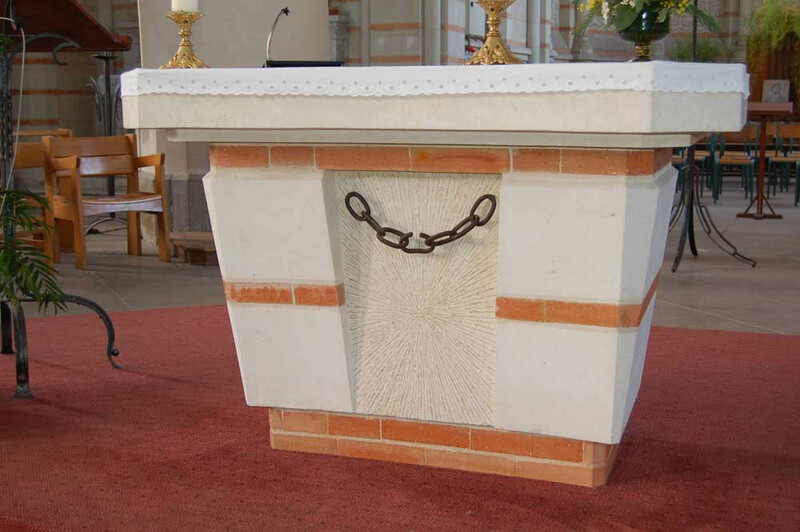 The relic was venerated and there were chains available to pilgrims which were supposed to calm their suffering. Today, Saint Leonard remains close to the faithful as the Patron Saint of all deliverance from the problems of life. 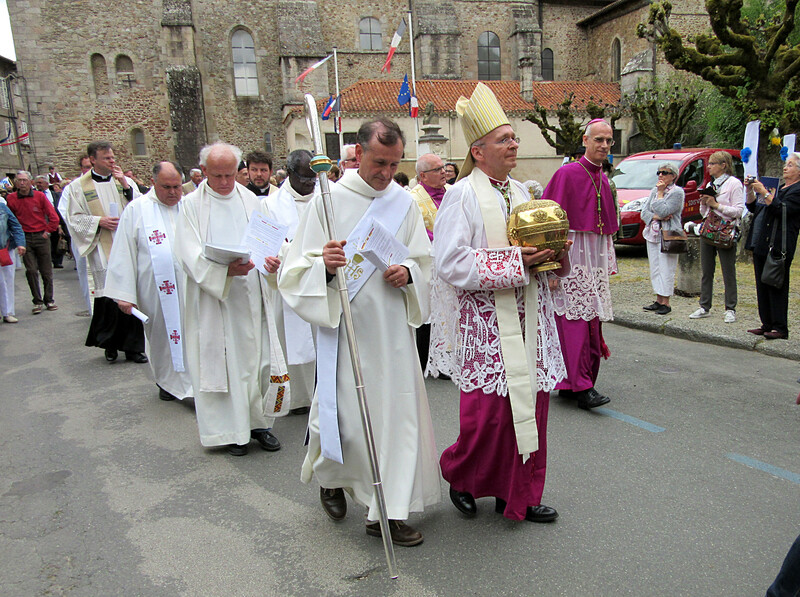 The feast of the Patron Saint is celebrated on the first Sunday after All Saints at Angers. 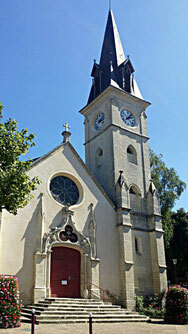 The Catholic community of L’Haÿ-les-Roses is in the southern suburb of Paris (Val-de-Marne) and is doubly attached to St.Leonard. Actually he is not only the Patron Saint of the parish in the town centre, he is also the patron of the oldest association of our community; the Association Saint Leonard (1926). Even if the two elements are close to one another they are nevertheless independent. The naming of St.Leonard as patron of our church is doubtless linked to the donations made by King Clovis to the church of Paris just after his conversion to Christianity. Our territory became the fief of the chapter of Notre-Dame de Paris and Leonard, who was close to King Clovis, became the Patron Saint of our parish. Today it is both strange and moving to realise that the Patron Saint of prisoners watches over a parish which ludes the major prison of Fresnes. The Saint Leonard Association was created on 18th February 1926 with the prime goal being the training of young people. 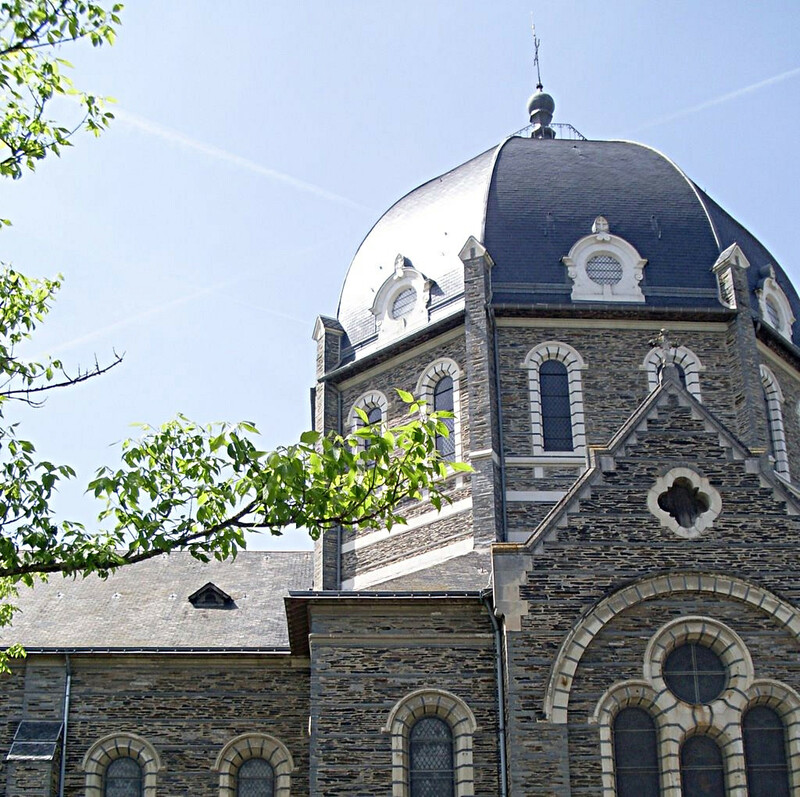 Its foundation is closely related to the separation of the Church and the State and to the huge growth of the suburbs of Paris between the two world wars. Its purpose was to involve young people in worthwhile activities and to develop a new space for mission work in those suburbs which tended towards left-wing politics which terrified many people. The patronage of football clubs, theatres, holiday centres fairs showed that the Association was very dynamic. 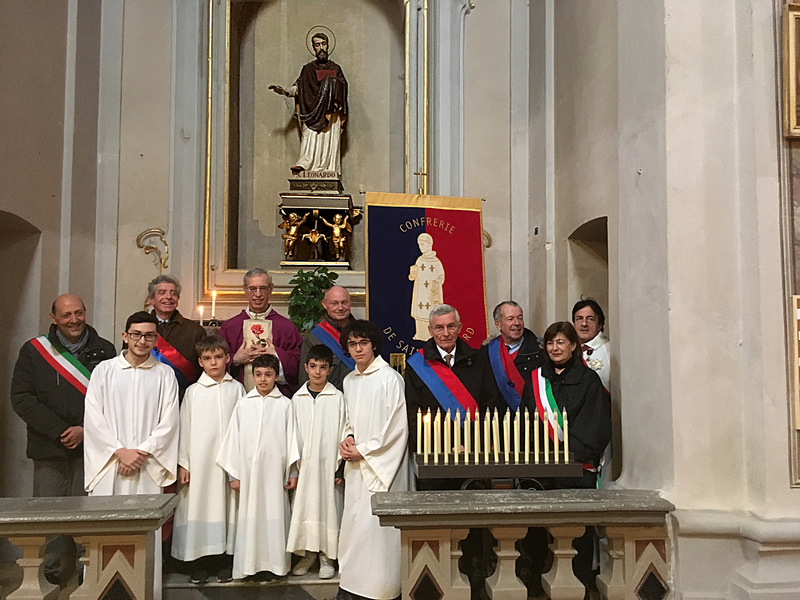 In 2017 the parish of Saint Leonard of L’Haÿ-les-Roses decided to celebrate with solemnity, and for the first time for many years, the feast of our Patron Saint on 6th November. To do this a panel reminding the parishioners of the life of St.Leonard was set up and inaugurated on 5th November. It was installed in the ancient church, very close to the statue of the saint. This panel is read on a regular basis by the parishioners as well as visitors. Saint Leonard watches over our parish and Association more than ever before. Sophie HASQUENOPH, Historian, Member of the EAP of the Parish of L’Haÿ-les-Roses. The architecture, the materials used, the study of Breton place names of fountains and the lands surrounding it, as well as the processional routes, would date its origins to the 13th century or before. 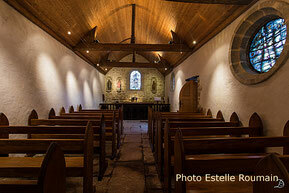 In the 19th century the rector mentions a chapel being present before the 12th century. A fountain where worship took place is 140m from the chapel. It serves as a sanctuary for 4 statues, one of which is of Saint Leonard in Saintonge stone which is inscribed in ISMH (supplementary inventory of historical monuments), dated between 1470 and 1490 and a magnificent statue of the Virgin Mary with the child Jesus resting on her hip, characteristic of the medieval Breton style from the same era and of the same sculptor. The original registered with ISMH was vandalised in 2013. 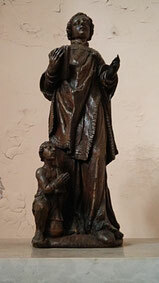 It has been reproduced in wood by Mr Portal and painted using the techniques of the 15th century; finally there is a statue of Saint Radegonde (in polychrome wood from the 16th century), and Saint Roch (ISMH) by A.Le Brun, a marine sculptor (1880). The town of Raches, with its 2800 inhabitants, is situated on the axis Lille / Douai on the banks of the River Scarpe and has been included in the parish “Notre Dame de la Paix en Pévèle”, made up of 5 churches for a population of 15400 souls which are part of the Diocese of Cambrai. 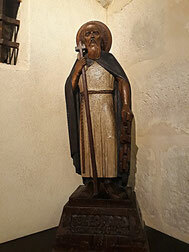 Since time immemorial Saint Leonard has been a significant object of devotion in the parish of Raches near Douai. The origins of this pilgrimage date from 1228. The chapel, which was granted great favours on a regular basis through the intercession of this great Saint shown by remarkable acts of healing, was restored in 1444. Not a stone of this building remains today. This chapel possessed a reliquary casket in copper containing a crystal cylinder in which the relics of Saint Leonard were placed at the beginning of the 17th century. 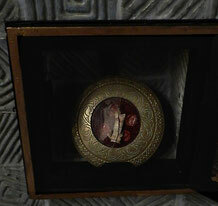 Another reliquary casket in silver, shaped like a tower, contained a large part of St Leonard’s jaw. During the upheavals of the Revolution this casket disappeared. This chapel, which served as the parish church after the revolution, threatened to fall into ruin when Father Gadenne was appointed parish priest. Only God knows the incredible difficulties which he met while replacing this broken down sanctuary with a beautiful church in a formal style on a place more central in the village. The church was formally consecrated and dedicated to Saint leonard on 28th June 1860 by Cardinal Régnier, Archbishop of Cambrai. 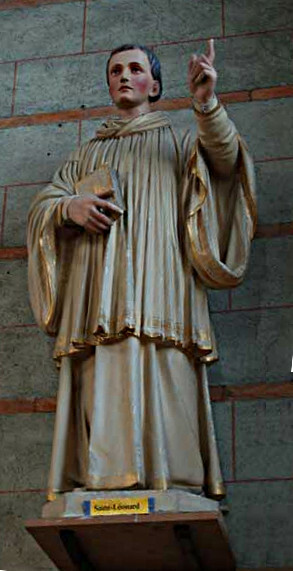 The statue of our Patron Saint of Raches is situated in the nave of the new church. The relic that we venerate today, which is about the size of a finger, is part of the arm bone of St Leonard. It is very small. It is the symbol through which all of our community recognizes St Leonard as our protector. It was a gift from Cardinal Déprez, the Archbishop of Toulouse and former Bishop of Limoges, to Father Gadenne the Canon of Amiens and Cambrai. It is during the Sunday mass that the relic is venerated, first in June when the anniversary of the consecration of the church to St Leonard is celebrated, and then in November on the Sunday following the feast of the saint. 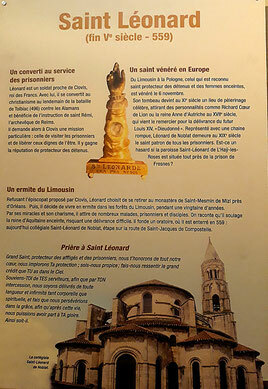 This is our presentation of the history of the veneration of Saint Leonard in our parish. 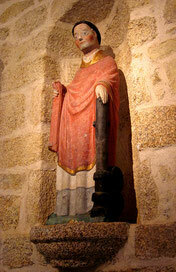 Today Saint Leonard is still considered as the protector of our village. Each of us recognises that we are under his protection. During the two venerations which occur each year, each of us confides to his intercession all of our prayers. The origin of the word “ostensions” comes from the latin “ostendere” meaning a showing. The Ostensions are, in fact, a ceremony which consists of presenting the relics of saints for the devotion of the inhabitants of the region. Originally they were organised as an appeal for the intercession of the saints of local origin to combat any epidemic or misfortune. The oldest known incidence was carried out in 994 in Limoges to try to solve an epidemic known as the “Mal des Ardents”. 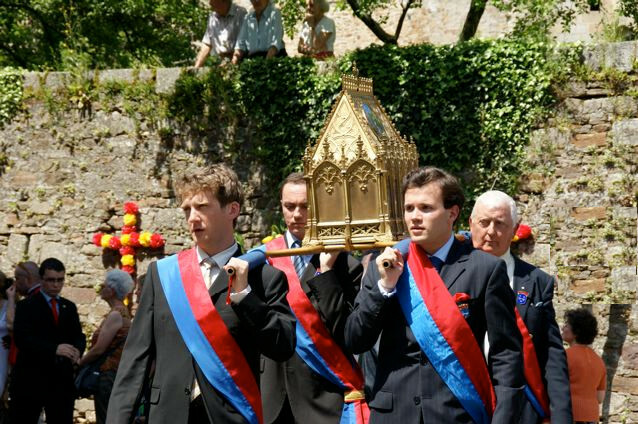 In Saint-Léonard-de-Noblat in1094 the same epidemic fell upon the inhabitants of the town, and the procession of the relics of Saint Leonard were carried through the town from the Collegiate Church to the little hill of Champmain where the stricken people were gathered. 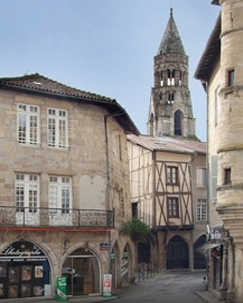 From the 15th century the Limousin Ostensions became a regular occurrence and, in 1561, the rhythm of these manifestations was fixed at intervals of 7 years. 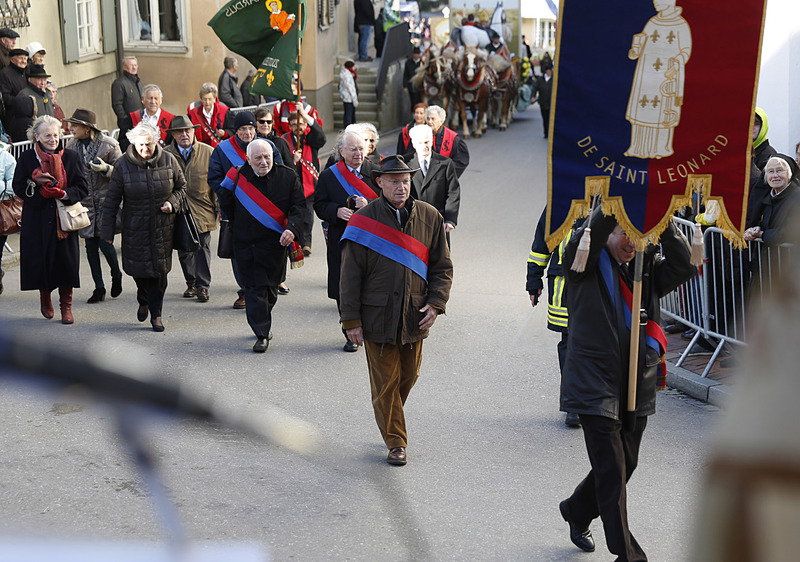 The Ostensions of Saint Leonard are organised by a committee in which the Confraternity, the Parish, the Town and numerous volunteers, whether Christian or non-Christian, participate. 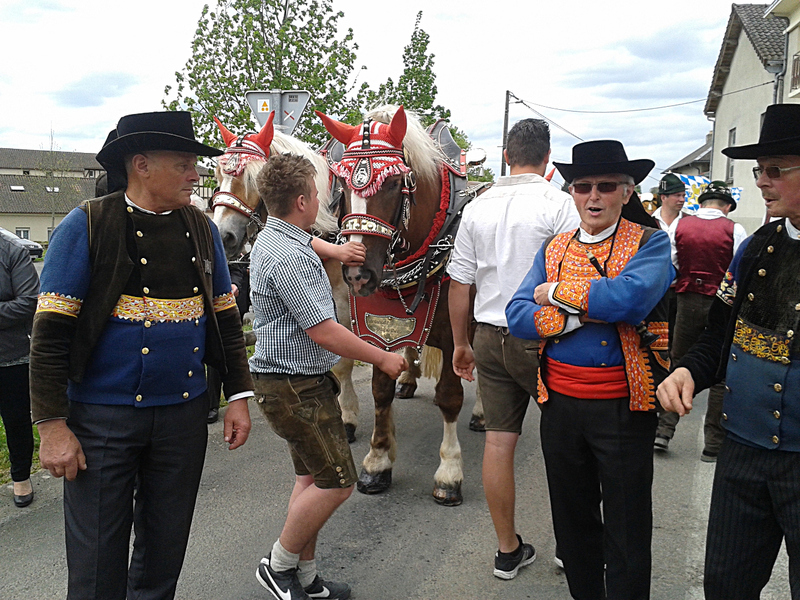 There is a general mobilisation of the population to decorate the town and the streets are covered with a ceiling of flowers following the route of the procession. The Ostensions Committee is legally constituted by a law for associations created in France in 1901. This Association was formed in 1994. We can expect more than 10,000 spectators and participants at these ceremonies. 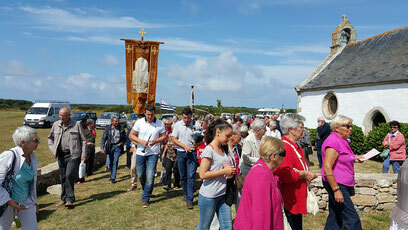 A speciality of the Ostensions of Saint Leonard is to welcome numerous groups representing the ‘other Saint Leonards’ throughout Europe and other parts of the world. In 2016, 25 delegations from abroad, coming from eight countries; 450 were participants at a special ceremony – The Mass of the Pilgrims, which was celebrated in several languages on the eve of the Ostensions. 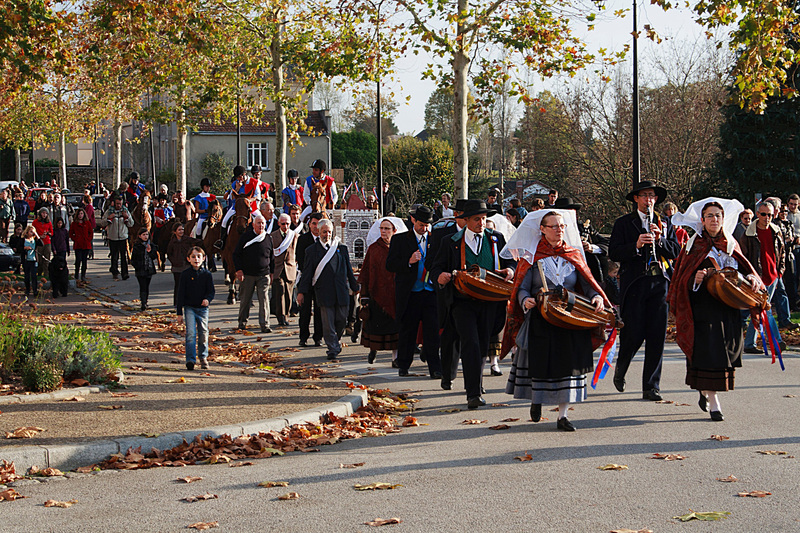 Since 2013 the Limousin Ostensions have been inscribed in the World Intangible Cultural Heritage of UNESCO. 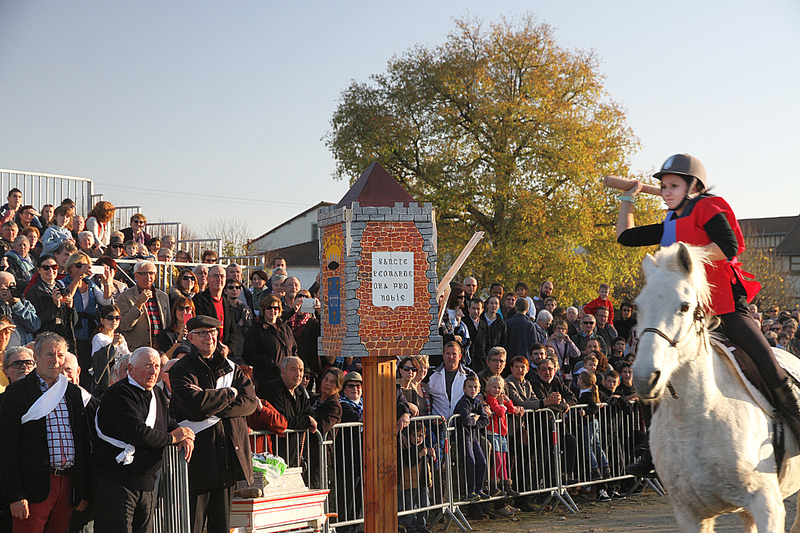 All the “Saint Leonards” are invited to participate in the Ostensions of Saint-Léonard-de-Noblat. The next Ostensions will take place during the weekend of the Ascension 2023. 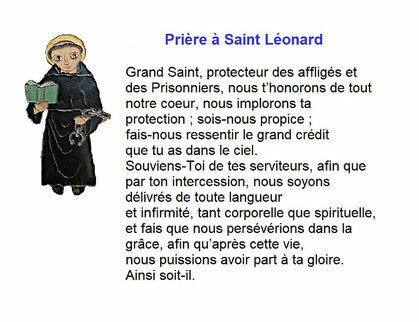 From that time on, at St Leonard de Noblat, a confraternity has carried on the cult of St Leonard, the patron saint of prisoners, following a variety of denominations and statutes. As protector of the relics since their origin it also assures the organisation of the main ceremonies in honour of the Saint and defends the values of denial of wealth and power, and the support for the reinsertion of released prisoners. The celebrations of St Leonard and the Quintaine, which are the principal manifestations undertaken each year, take place after the feast day of the Saint on 6th November. The game of the Quintaine which brings this period to a close, is a festivity in which many people participate and which evokes the liberation of prisoners. A wooden model of the prison (the Quintaine) is carried in procession through the town, having been blessed at a special mass in the morning, and is then destroyed in the afternoon by riders on horseback armed with clubs known as ‘quillous’. The broken pieces of the Quintaine are distributed to the spectators. The historic origin of the Confraternity requires that it be made up of 30 gentlemen. Today the group, administered under an association of the law of 1901, is now open to new members from abroad (Italians, Germans, Belgians and Maltese). In addition, in order to react to the fact that institutions dedicated to Saint Leonard are to be found thriving throughout Europe and other parts of the world, the Confraternity organises excursions to these places which have the name of their Patron Saint. 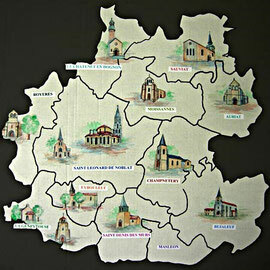 This region is mainly rural. The main activities are agriculture, cattle and sheep raising, market gardening, cultivation and production of apples, as well as some industry (porcelain, leather). The hospital of St Leonard is the main employer of the town and a new hospital is under construction. There is a very active involvement in associations which bring together senior citizens and younger adults who are active in the area covered by the parish. These include choirs, walking groups, tourist activities, service clubs, board game groups. There is a small cinema showing up-to-date films in the town. The personnel of the parish are a parish priest and two deacons, helped by a pastoral team made up of 3 lay people, the priest and one deacon. 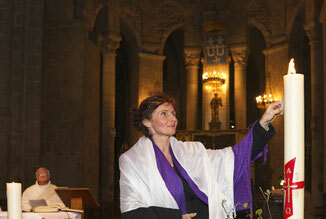 Their pastoral mandate is conferred on them by the Bishop of the Limoges diocese. The Pastoral Council of the Parish also makes a valuable contribution. The Economic Council of the Parish oversees the management of the material resources used for the mission of the parish . The three gifts and missions of all those who are baptised as proclaimed by the Second Vatican Council which took place from 1962 to 1965 are to – welcome and proclaim the Word of God, live a life of personal and communal prayer and practice of the Sacraments. The construction of the Kingdom of God with children, youth and adults. A variety of groups, as from childhood until old age, calling and helping to live this gift and this mission for those who are baptised: awakening to faith through catechism, Catholic Action for children, preparation of the liturgy for services particularly Sunday Mass, Bible study groups, Catholic Action for workers, Christian Movement for retirees, preparation of the Sacraments, (baptism, confirmation, extreme unction ….) Evangelical services for the sick, hospital chaplaincy, missionary cooperation and twinning with the Parish of Séguénéga in Burkina Faso, Secours Catholique, Rosary team and the Confraternity of Saint Leonard. 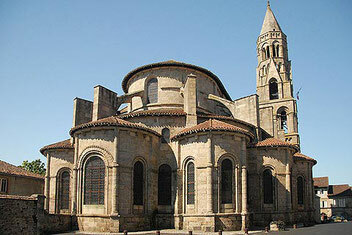 The Collegiate Church which is inscribed as a World Heritage Site by UNESCO as a major religious building on the pilgrimage route to Santiago de Compostella. The Noblat bridge, a mediaeval crossing point of the River Vienne. Saint-Léonard de Noblat is situated in the heart of the Limousin in the land of trees and water. It is the main town of the canton within the department of the Haute Vienne and an integral part of the region now called Nouvelle Aquitaine. 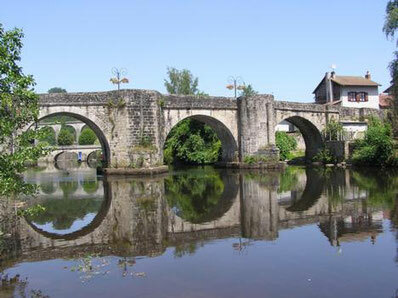 With a population of over 4800 inhabitants, nicknamed “miaulétous”, it extends along the northern bank of the River Vienne at approximately 30 km east of Limoges. It has been labelled the ‘Land of art and history’, as well as a town with ‘local commerce’ and a ‘floral aspect’. 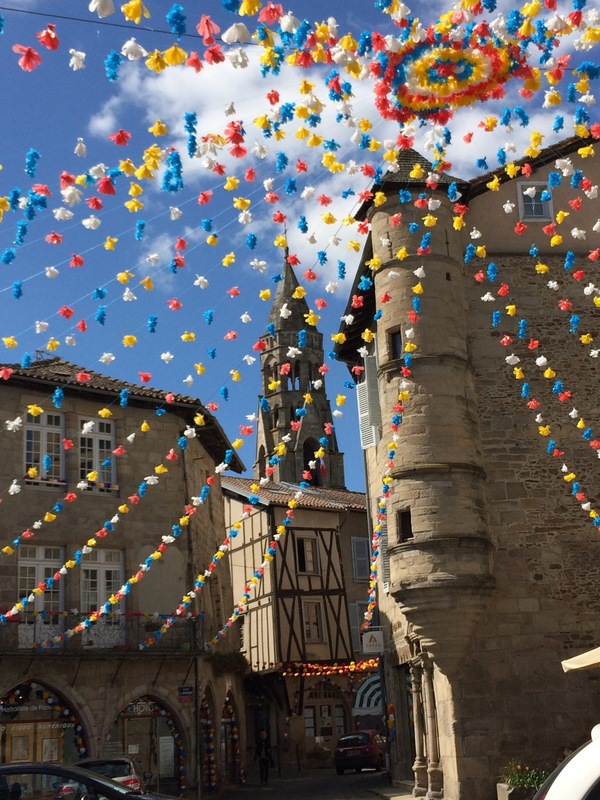 Saint Leonard is also known as one of the ‘most beautiful detours in France’. The town allies both modernity and a witness to its historical past. It is crossed by one of the main pilgrimage routes to Santiago de Compostella, (the tomb of Saint James), called the ‘Vezalay Way’. 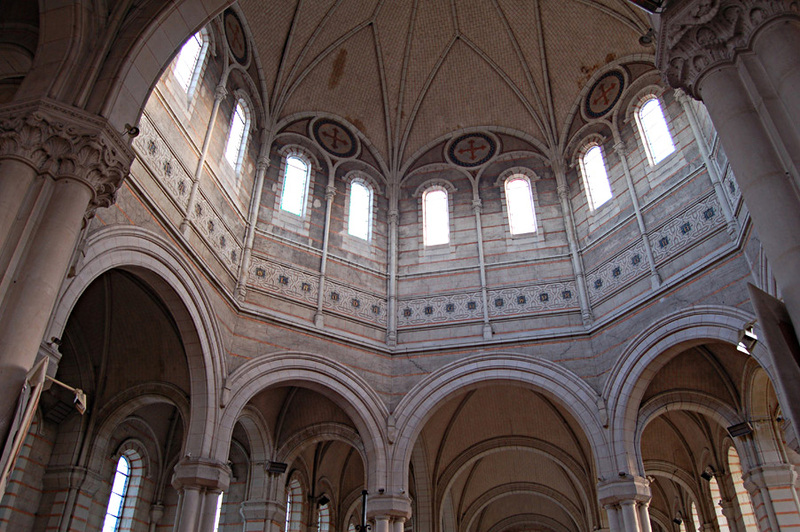 The Collegiate Church in Romane style architecture built between the 11th and 12th centuries has an ambulatory with seven chapels radiating from it. The Collegiate Church is inscribed as a World Heritage Site by UNESCO as a major religious edifice on the route to Santiago de Compostella. 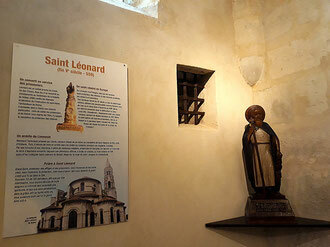 The Church conserves the relics of the founding saint of the town, Saint Leonard, a hermit of the 6th century who was revered as the patron saint of prisoners. The bell tower, which is built on seven storeys, is dominated by a spire which reaches a height of 52 metres. Around the Collegiate Church narrow roads guard the centre of the mediaeval city, which once was surrounded by walls. The quality of its architectural patrimony merits its classification of ‘Remarkable Heritage Site’, the only one in the ancient region of the Limousin. The village of Pont du Noblat is sited on two banks of the River Vienne. The railway viaduct there is described in the Railway Museum ‘Historail’ dominates the valley with its 22 arches. The prosperity of the town was based over a long period on its artisanal knowledge and its industries : leather, paper and porcelain. The workshops and factories open their doors to visitors : the porcelain workshops of Coquet and Carpenet, the tannery Bastin a, nd the traditional paper manufacturer Moulin du Got are among those. The Moulin du Got has been producing paper for five centuries – hand- made paper and cardboard. There they also use traditional techniques of printing from the 15th to the 20th centuries. Saint- Leonard-de-Noblat is the cradle of Limousin cattle. The sale of these red-skinned cattle has been noted since the 13th century. Several notable people have bought fame to the town. The physician and chemist Louis-Joseph Gay-Lussac (1778 – 1850) and Raymond Poulidor the champion cyclist in the 20th century, are among those.